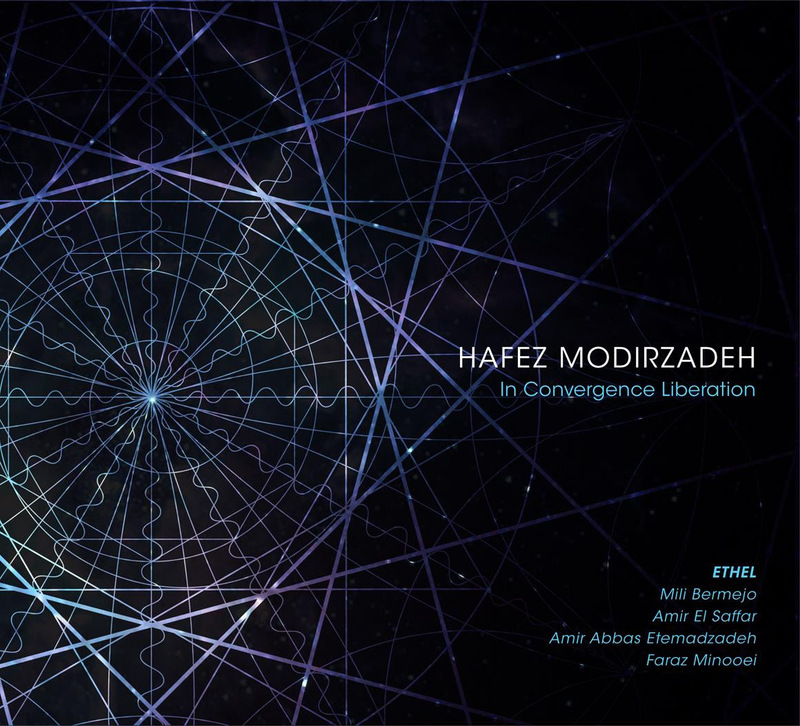 In Convergence Liberation represents the latest step in saxophonist Hafez Modirzadeh’s thirty-year quest to create a seamless exchange between different musical cultures. It follows his 2012 release Post Chromodal Out!, which featured a piano re-tuned to variations of Persian temperament, as played by Vijay Iyer. The new work explores Modirzadeh’s “chromodality,” a cross-cultural musical concept which allows for the co-existence between different musical temperaments, which Modirzadeh originally derived from his own American jazz and Iranian dastgah heritages. The seven chamber works on In Convergence Liberation utilize such disparate influences as Persian and Iberian scales, Andalusian poetry, the Iraqi maqam, and the classical string quartet tradition as performed by Argentine-Mexican vocalist Mili Bermejo (vocals), Iraqi-American Amir ElSaffar (Iraqi santur, vocals and trumpet), singing in Spanish and Arabic, respectively, Faraz Minooei (Persian santur), and Amir Abbas Etemadzadeh (Persian daff and tombak). A collection of tone poems and song cycles, the works on In Convergence Liberation include La Angustia de los Amantes, a Spanish rendition of a poem by the 13th century Persian poet and philosopher Jalāl ad-Dīn Rūmī which utilizes the notion that there is gravity to sound. Employing utilizing gamelan structures, Tetraspheres involves players going inside a unison tone, creating a musical system of various partials of the harmonic series to liberate the music from culturally imposed constraints. Karnā Passages features Modirzadeh on an ancient Persian double-reed instrument hybridized with a bassoon reed and sawed-off trombone bell. Las Orillas del Mar feature lyrics from an anonymous Andalusian poet of 14th century Spain. Number That Moves derives from abstracts motifs from the original notation of the Adagio section of Beethoven’s Piano Sonata no. 26, where the absence of bar-lines shifts perspective towards collective interdependence. In Suite Compost by cutting up and reconstituting themes and lines from several dozen existing string quartet compositions and empowering the musicians to transcend the linear, the music of Mozart through Bartok shape-shift into one another. Finally, Sor Juana is from the poem Sátira Filosóficaby Mexican poet Juana Inés de la Cruz (1651-1695). Mili Bermejo resurrects the voice of Sor Juana in its original Spanish, using a mode common to both Persian and Andalucian traditions, while Amir El Saffar provides vocal support in Iraqi maqam, reflecting eight centuries of Arab Spain resonating in Sor Juana’s colonial Mexico.